A few weeks ago we posted a couple of images from our Berry & Co photography collection of women dressed in uniform. 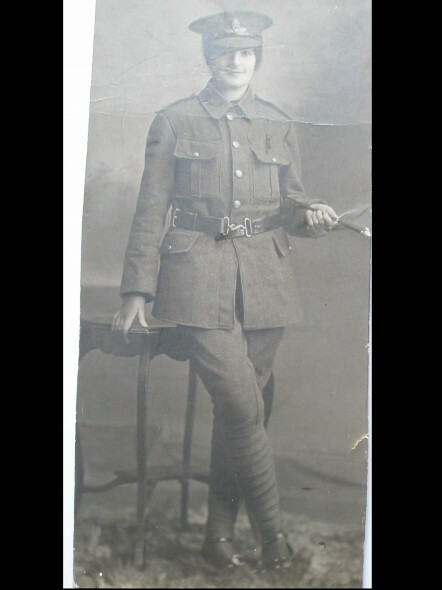 Thanks to the power of the internet and the media we have been able to positively identify one of the women, and learn a little more about her life, and why she was photographed dressed in the uniform of a Gunner in the Royal New Zealand Artillery. Miss Kathleen O’Brien of Napier. The above photograph is of Kathleen Veronica O’Brien (1890-1973), the daughter of Irish immigrants who settled in Hawke’s Bay. Kathleen was one of five children – two girls and three boys. Kathleen’s niece made the identification. She has an original print (below). The print is quite different to our scan of the glass plate negative. The image has been tightly cropped to ensure that the eye focuses solely on Kathleen and is sepia in colour. 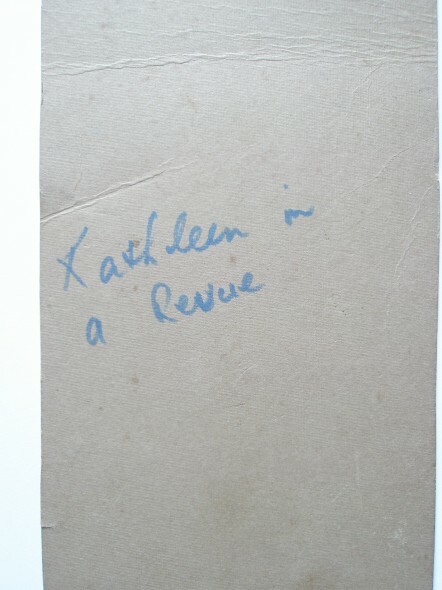 While it is fantastic to see a real print, best of it features an inscription on the back – ‘Kathleen in a revue’ – which confirms our own suspicions – based on the dance shoes and rosette – that she was dressed up for some sort of performance. Inscription on the back of an original print of the Berry & Co photograph. Kathleen is remembered by family as being a theatrical type. She is believed to have been a member of The Napier Frivolity Minstrels, a musical society which was ‘established in the year 1897, with the object of raising money by public entertainments for charitable purposes’. During the First World War ‘The Frivs’, as they are still affectionately known, sought to do their bit. As early as September 1914, they presented a Patriotic Concert in aid of the Belgian Relief Fund to assist ‘Belgians in distress’. (By early 1915, New Zealanders had contributed over £37,000 to the fund). During the early stages of the war, theatre groups often created tableaux featuring performers dressed as soldiers and nurses. As the war unexpectedly dragged on, however, such fund-raising events began to come under fire as unease mounted around having fun while others were fighting for King and Country. In July 1915 the Otago Daily Times reported on a speech given by the Reverend R E Davies at a Carnival Queen event. While he congratulated the organisers, he acknowledged the controversy that was growing around the ‘carnival movement’, and stated that while the carnival raised money for a good cause, namely the Wounded Soldier’s Fund, ‘in this critical situation of the Empire he felt it his duty to say that no man should take part in the carnival whose duty it was to stand in the ranks of our defenders’. Napier Frivolity member Harry Evetts, certainly agreed with Davies. In April 1916, the Free Lance reported that Harry had ‘given over “Frivolity” for war’, and traded his membership in The Frivs for a position as a driver in the ‘Twelfths”. ‘No more frivolity, he says, till Kaiser Bill is knocked out’. It was due to such departures, that the previously all male troupe opened the company up to women. Now back to Kathleen… Going by the sequence number on the glass plate, it is thought that image was taken between August and December 1914, well before such unease had set in. The question is now, why was Kathleen who lived in Napier, photographed in costume in a Wellington studio? Apparently, the Napier Frivolity Minstrels did travel the country with their shows, but sadly most of their records were destroyed in the Hawke’s Bay Earthquake and subsequent fires of 1931 so we don’t know if Kathleen had joined by then let alone ever travelled with them. Alternatively, as Kathleen visited the capital fairly regularly to see her sister Mary, she may have taken part in a Wellington event. Of course like many New Zealand women, Kathleen came to have a personal association with the war. Her brother Michael enlisted and embarked from Wellington on 14 August 1915 as part of the Wellington Mounted Rifles (Serial No. 11/1510). His first rank was a Quartermaster Sergeant. Her little brother Francis also joined up later that year. He was a Sapper (Serial No 4/1460). The O’Brien’s, however, were a lucky family, for both of the brothers returned home to live fruitful lives. As to Kathleen, she worked as a cook in Napier and stayed single until in her 60s. She passed away in Masterton in April 1973, and is lovingly remembered as a lively aunt who spun a good story. To find out more about Te Papa’s Berry Boy soldier identification project click here. If you have any information you can share about the Berry Boys (or Girls) – either a soldier or someone they are photographed with – please email berryboys@tepapa.govt.nz, or leave a phone message for us on 04 381 7129. You can also write to Berry Boys Project Team, Te Papa, PO Box 467, Wellington 6140. We’re interested in names, stories, tiny snippets of information – anything that helps us know more about these people’s lives before, during, and after the war. To aid identification, please be sure to include the Te Papa registration number (B.044366, for example) for the photo in question. Most of all, thank you for your help!